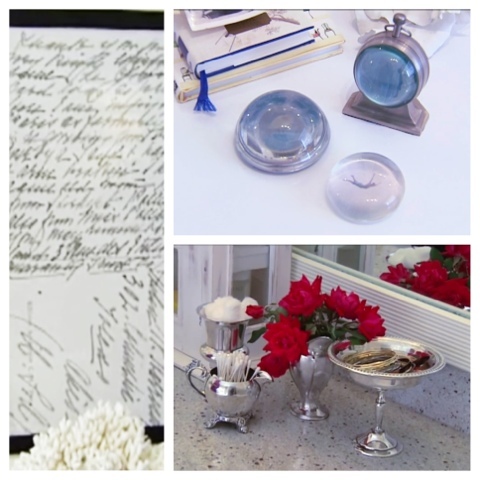 Some of the items I used in the segment were loaned to me by my mom, who is an antique dealer and collector in Southeast Texas. You can read more about her here. She's a great resource for American antiques as well as a huge inventory of Victorian, shabby and garden/cottage antiques. Dealers love working with her because she loves to wholesale large quantities to fill up your shops! She also sells to decorators as well so if you're looking for something specific for a client, let me know and I'll put you in touch with her. It was such a fun experience to work with the awesome Andrea, one of the show's producers, and Reggie, who is not only a camera man, but an expert at lighting and editing. Many thanks to them for making me comfortable in front of the camera. 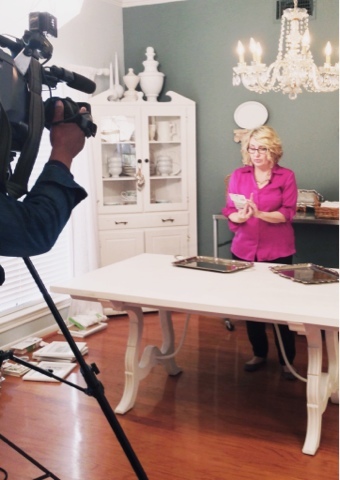 Deals airs locally in Houston on Saturday mornings at 8am on the Hallmark channel, Comcast channel 315. Click here for showtimes where you live. Also, thanks to Holly Mathis who had a hand in making this happen. Holly will be set up this weekend at Urban Market with what I am sure will be the cutest booth ever, so go say "Hi" I hope to stop by myself so maybe I'll see you there!